Let's use xt to apply this stylesheet to compositions.xml. So we need a way to get content from attributes in the input document. This is accomplished by prefixing the attribute name with @. Require a way to copy nodes from the input document to attribute values in the output document. Right now the descriptions in the output document are pure text. The descriptions in the input document are somewhat more styled and include paragraphs, unordered lists and citations; e.g. Right now the descriptions in the input document only use a few HTML tags, but potentially they could use full HTML up to and including tables, images, styles, and more. You could include separate template rules for each of these, but it's easier to specify a rule that applies to all elements. The output is the same in this case, though for a document that used more HTML it might be different. Are we being too greedy? Perhaps this is too greedy. Do we really only want to recognize HTML in the description element? What if somebody puts HTML in a different, element like instruments? What if somebody makes a mistake and adds an element that shouldn't be there? I don't think so, but it would be possible to use modes or other techniques to make this default rule only apply inside the description element. The composers and their compositions are linked through the the id attribute of the composer element and the composer attribute of the composition element. xsl:for-each iterates through the selected nodes, setting each one to the current node in turn but does not apply templates to that node. We need to add <a name="some_name">title</a> around each composition title so we have something to link to. The generate-id() function will choose a unique ID for a particular element. Although the ID is generated in two separate places, it is generated for the same node. Consequently, they are the same. These may be part of any select expression, but are most commonly used in xsl:value-of. XSL does not, however, provide full Perl or POSIX regular expressions. These may be part of any select expression, but are most commonly used in predicates with comparison operators. Where Does the XML Transformation Happen? The XML document and associated style sheet are both served to the client (Web browser), which then transforms the document as specified by the style sheet and presents it to the user. 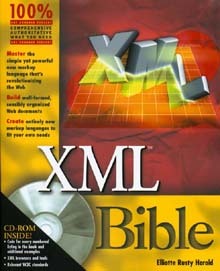 The server applies an XSL style sheet to an XML document to transform it to some other format (generally HTML) and sends the transformed document to the client (Web browser). A third program transforms the original XML document into some other format (often HTML) before the document is placed on the server. Both server and client only deal with the post-transform document. Place an xml-stylesheet processing instruction in the prolog immediately after the XML declaration (if any) and before the document type declaration (if any). This processing instruction should have a type attribute with the value text/xsl and an href attribute whose value is an absolute or relative URL pointing to the style sheet. This is also how you attach a CSS style sheet to a document. The only difference here is that the type attribute has the value text/xsl instead of text/css. What else does XSLT have? Many more ways to select and match elements including descendants, attributes, comments, processing instructions, and text. The xsl:element, xsl:attribute, xsl:processing-instruction, xsl:comment, and xsl:text elements can output elements, attributes, processing instructions, comments, and text calculated from data in the input document. The xsl:variable element defines named constants that can clarify your code. Named templates, variables, and attribute sets help you reuse common template code. The xsl:choose and xsl:when elements let you select one of several possibilities depending on a condition. The xsl:import and xsl:include elements merge rules from different style sheets. Various attributes of the xsl:output element allow you to specify the output document's format, XML declaration, document type declaration, indentation, encoding and MIME type. What does XSLT not have?